On her Twitter page today Kylie wrote….I was 8, sang with ABBA (Read – hairbrush/lounge-room), treasured my knee-high ABBA socks….spoke w Benny yesterday….Aaaaaaahhhhhh!!!.. Kylie has been a long time ABBA fan. Check out the interview we did with her about her love of ABBA in the 90’s. (On line September 1st) Kylie Minogue will perform Super Trouper and will be joined on stage by Benny Andersson for a rendition of When All Is Said And Done. Kylie says she just spoke to Benny yesterday and is sooo excited! Comments : Comments Off on Benny and Kylie! Australia’s very own “Dancing Queen” ,Kylie Minogue will be be appearing at the ‘Thank You For The Music: A Celebration Of The Music of Abba’ concert in London’s Hyde Park on Sunday 13 September 2009. Kylie will perform her versions of Abba hits Super Trouper and When All Is Said And Done, on which she will be joined by Abba’s Benny Andersson. BBC Concert Orchestra conducted by Anders Eljas. Comments : Comments Off on Kylie The Super Trouper! 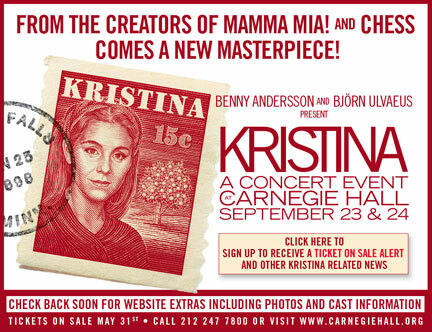 The Official Kristina site has now finally been updated with the full casting. You can also hear the medley once again in the Sights and sounds section. Sarah Dawn Finer New Album! The totally awsome Sarah Dawn Finer’s new album “MOVING ON” released today went straight to No. 1 on ITUNES (Sweden)! SDF releases her new album MOVING ON in a digital version on iTunes today! The album will be out in Swedish stores on Aug 26th! Sarah has worked with Agnetha, Peter Jöback and Benny to name a few! Comments : Comments Off on Sarah Dawn Finer New Album! Radio 2 today announces the first wave of glittering artists who will perform at the ‘Thank You For The Music: A Celebration Of The Music of Abba’ concert in London’s Hyde Park on Sunday 13 September 2009. Presented by Radio 2 Drivetime host Chris Evans, the gig will be broadcast live on Radio 2, with contributions from two members of Abba, Benny Andersson and Björn Ulvaeus, and a performance by the full West End cast of the musical Mamma Mia! Lulu will sing ‘Gimme Gimme Gimme’ on the night, Grammy Award-winning American singer-song writer Chaka Khan will perform ‘The Winner Takes It All’ .British band The Feeling will sing ‘Knowing Me, Knowing You’. Texas front-woman Sharleen Spiteri will sing ‘SOS’, VV Brown will sing ‘Ring Ring’, BBC Radio 2 presenter Elaine Paige will sing her classic 1985 hit duet ‘I Know Him So Well’ from the musical Chess, with the production’s original Svetlana, Siobhan McCarthy. Jodie Prenger will perform ‘One Of Us’. Other artists performing on the night include Nerina Pallot (‘The Name Of The Game’), Christian Jon Billet (‘Anthem’) Beth Nielsen Chapman (‘Fernando’), The Benny Andersson Band, West End star Kerry Ellis with ‘You Have To Be There’ taken from Benny and Bjorn’s new musical production Kristina, Marti Pellow singing ‘One Night In Bangkok’ and Jason Donovan (‘I Have A Dream’). Other hosts include long-time collaborator with Benny and Bjorn and multi-award winning lyricist Sir Tim Rice and Swedish actor and star of the hit movie Mamma Mia! Stellan Skarsgard. The concert will also feature a performance by the full West End cast of the musical Mamma Mia! The event will be broadcast live on BBC Radio 2 from 6.30-9.30pm.